This January marks the eighth year that I’ve been doing Weight Watchers. While my weight has fluctuated since reaching my goal and I’m now actively trying to lose weight again, I really feel like it was joining Weight Watchers that prompted me to learn how to cook and get creative in the kitchen. Because before Weight Watchers? Our meals were pretty much take out, stir fry or pasta. Pasta showed up on the menu at least once a week. I’d make a whole box (!!!) and my husband and I would split it. He’d put lots of sauce on his, while I’d put a little bit of sauce and a mountain of grated Parmesan on mine. I was under the impression that a ginormous bowl of pasta was a typical serving–after all, that’s what most restaurants serve, right? It was a shock to find out that those big boxes of pasta that my husband and I were eating by ourselves are meant to serve eight people. Oops. One of the first changes I made when I joined Weight Watchers was downsizing those pasta portions. But clearly, two ounces of pasta alone just wasn’t going to cut it. So I started adding vegetables to our pasta. Lots of them. This makes that paltry two ounces of pasta go much further. And you know what? It tastes so much better that way too. Using this same philosophy, I revamped my baked ziti recipe, something I occasionally made pre-Weight Watchers–my original version had massive amounts of cheese and pasta. This version, Vegetable Baked Ziti, has a smaller amount of reduced-fat cheese and fat-free ricotta mixed in to give the casserole a creamy texture. By adding lots of sauteed veggies, each serving contains less than two ounces of pasta. But it’s so good, you won’t miss that extra pasta or cheese at all! 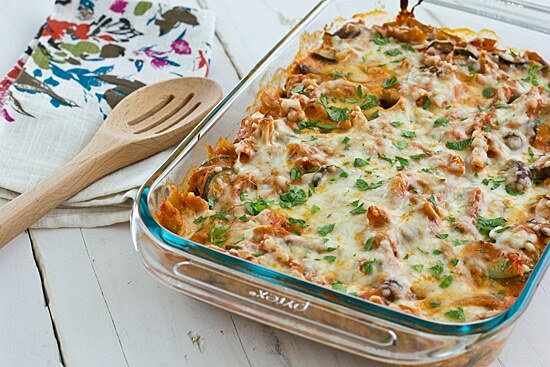 Baked ziti doesn’t have to be over-loaded with cheese to taste good! My recipe has a creamy sauce, thanks to the addition of fat-free ricotta, and lots of sauteed veggies. Preheat oven to 350 degrees. Spray a 9 x 13 baking dish with cooking spray or oil mister. Pour pasta mixture into baking dish. Top with cheese. Bake for 30 minutes. Sprinkle with parsley before serving, if desired. Sounds terrific. Can this be frozen? Would love to take it to the beach. Yes, it freezes very well! You’ll want to thaw it in the fridge for a day or two (depending on your fridge temp)–once it’s thawed, it can be heated at the same temp and time listed in the recipe. This might be a silly question but–do you skip baking it the first time if you are freezing it? I made this tonight and it was really good! It was a great way to use up a giant farmer’s market zucchini. Thank you! Made this on a whim tonight and it tasted fantastic. I cut the amount of cheese roughly in 1/2, and also broiled the whole thing for about 5 minutes at the end, until the top layer was nice and crispy. Thanks for your comment–I’m glad you enjoyed it! Made this tonight for dinner. Yum. Thanks for the recipe. I didn’t realize before I added the pasta that it should be cooked! So, I added some water and cooked it for ~12 minutes extra–turned out right 🙂 That’s one way to cut out a step for simplicity! Well hey, you successfully eliminated a step from the recipe! 🙂 I’m glad it turned out well for you! Do you know what the calories are for this? The recipe looks great!! I plan to try it this weekend. Thanks for sharing all your recipes, I just joined weight watchers and taking pasta off the menu was a sad thing for me so am soo happy to see you successfully can have pasta without overdoing!! Thanks again!! I haven’t made it with spinach, but I’m sure that would work just fine! I’ve been making this about once a month since May. Thanks for this recipe! Made this yesterday. I ended up with 8 servings. So good! Hi do you know what the weight watcher points are for this? It used to be 7, but that was 2-3 plans ago – I don’t know about on the new plan. Right so I don’t know where I went wrong but my pasta came out hard on the edges, like really hard but only on the edges of the dish, should I have added a little water? Usually the edges of baked pasta dishes like this come out a bit hard, but if it’s way too hard, I’d say try a different baking dish. Maybe switch to a metal dish if you were using glass, as metal can get a bit hotter. You could also try covering the dish with foil to keep moisture in, and then uncovering during the last 10 or so minutes of baking, just to get a little browning. I hope that help! I made this yesterday and it was very good. I am not a huge fan of Ricotta but I still liked it. I measured every single ingredient by weight and my dish ended up being 470 calories per serving which is very good for a pasta dish.